TDS deducted but not Deposited by employer? How to check TDS online? You are here: Home / Tax Planning / TDS deducted by Employer but not Deposited? How to check TDS details online? TDS deducted by Employer but not Deposited? How to check TDS details online? If you are a salaried person, I am sure you might have heard about Form 16. This document is issued by the employers every year. It is your ‘Salary or Income Certificate ‘and has the details of the TDS deducted (Tax Deducted at Source) by your employer. If your projected income after considering your income tax declaration and provisional investment proofs (if any) is above the basic income tax exemption limit, your employer is bound to deduct TDS from your Salary. The TDS deducted by your employer will then be deposited in Central Govt’s account against your PAN number. Though TDS is deposited by the employers on quarterly basis, generally they issue Form 16s after end of FY i.e., during April to May period. Employer deducts TDS but fails to deposit it in central govt account. This can be intentional or due to ignorance. There are cases where Employees provide wrong PAN numbers when joining an organization. So, even if an employer deducts TDS and deposits amount with the Govt, this is not reflected in the concerned Employees tax credit statement (Form 26AS). Employer may record wrong PAN numbers of their employees. Another possible reason can be, TDS is deducted but a different amount is deposited. Below are some of the queries on ‘TDS deducted but not deposited’ cases that have been posted on ReLakhs. 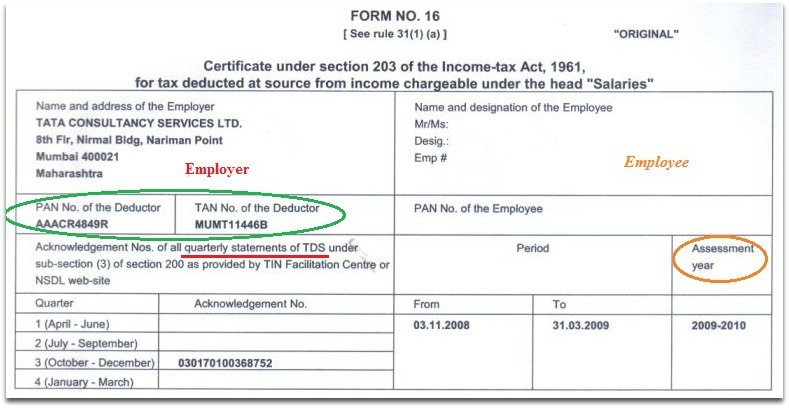 How to check if TDS deducted by your Employer is deposited against your PAN? Your employer may issue Form 16 (TDS Certificate) on annual basis. But, don’t wait till May to cross-check the TDS deducted details with the details available in your Form 26AS. When a TDS is deducted by your employer, it gets reflected in your Salary slip. So, you get to know if the TDS has been deducted or not through your salary slip. What is Form 26AS? – Form-26AS gives you all the details of Tax credits. It is a form which indicates the tax that has been deducted and has also been deposited with the Govt. Any TDS which is deducted from your income is deposited by the deductor to the government against your PAN number. This way, TDS deducted against your income is linked to your PAN and can be viewed and verified from your Form 26AS. The TDS amounts reflected in Form 26AS and Form 16/16A should always be the same. If the TDS which has been deducted from your salary is deposited with the Govt, it has to be found in your Form 26AS. So, it is better to check the TDS deducted details in the same Quarter itself, by visiting the IT e-filing website. Kindly login to IT e-Filing portal with your credentials. Click on ‘View Form 26AS (Tax Credit)’ link. Select applicable Assessment Year, view as format (PDF/HTML/Text) and click on ‘Download’ button. You can find the details of TDS deducted by your employer(s) in Part-A section of your Form 26AS. One of my friends has shared his AY 2010-11 Form 26AS with me. I have taken screenshot of his tax deducted details as below. You can find his employer’s name (deductor), TAN number of employer (cross-check if it is the same in your Form 16), salary credited, Tax deducted and TDS deposited details. We have cross-checked these details with the details available in his Form 16 and they are matching. Similarly, you can also cross-verify the TDS details in your Form 26AS and Form-16. Advisable to check this once in every quarter or atleast before the end of every Financial Year. Can the Tax dept recover the tax amount from you (employee) again? The CBDT (Central Board for Direct Taxes) in one of its circular has clarified that the liability to pay income tax, if TDS is deducted at source, will be on the employer and not on the employee. The employer also has to bear any interest charges and penalty for late tax filing. It has also been stated that in case an employer fails to provide you a Form 16 (by 31st May) after having deducted TDS – the minimum penalty that the employer will pay is Rs 100 for every day the default continues. If you do not receive your Form 16, you can write about this failure of your employer to your Assessing Officer, who may take appropriate action against the employer. This scenario occurs mainly when you are employed with multiple companies in a Financial Year. Your previous company may just settle the dues without deducting any TDS. In such a case, you need to add your income from all the sources and calculate the tax liability correctly and pay them. This may happen because you do not submit the investment proofs details to your employer within the stipulated time and they may deduct TDS from your salary. In case, if your declared amount is less than your actual investments, your company might have deducted higher TDS. So, you can claim this as ‘refund‘ while filing your taxes. Even if you miss the deadline for submitting the investment proofs, you can still claim all the tax deductions (except few allowances like LTA or Medical allowance) while filing your Income Tax Return. In case, if your declared investment amount is more than your actual investments, you have to pay additional taxes while filing your Income Tax Return (or) your company may re-calculate your tax liability and can deduct taxes accordingly. If you find any discrepancies between your Form 16 & Form 26AS, inform your employer (or ex-employer) immediately. You can request them to correct or revise the TDS entries in your Form 16. Even after repeated request if they do not update your form 16, you may go ahead and file your ITR. If TDS has been deducted and not deposited, you can file your ITR based on your Form 16. You can mention the employer’s TAN number in ITR. The tax department may then issue notices to your employer. If your employer fails to issue Form 16, you can file your income tax return based on your Payslips. Your payslips will have TDS details (if tax has been deducted). Provide correct PAN number to your employer. Make sure your PAN number has been recorded correctly in your Employer’s database and in your Form-16. Try to submit all your investment proofs, expenses receipts (like House rent receipts, medical bills etc.,) details to your employer on time. Once in a while, during the FY, cross check the TDS deducted (if any) details with your Form 26AS. If you find any discrepancies, inform your Employer and request them to revise your Form 16 immediately. Save copies of your Pay slips, Form 16s and Form 26AS for your future reference. If you have changed your jobs during the financial year, it is advisable to submit your income from previous employment to your new employer. If you do so, the form 16 which is released by your new employer can have all the required details and TDS will be deducted accordingly. Do note that you need to enter the TDS deducted by your current as well as previous employer in your ITR, and pay taxes (if any). In case if TDS is deducted and not deposited, you are advised to file your income tax return based on your payslips and pay taxes. If you receive any tax notice from the IT dept, your employer is liable to pay penalty. 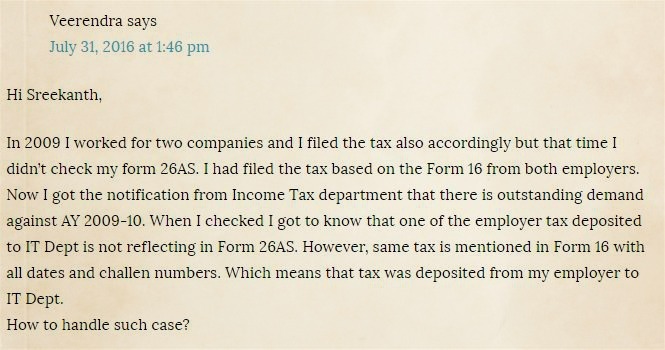 Always check your Form 26AS before filing your annual income tax return. Latest News (Post on 25-Oct-2016) : All the Private & Govt Salaried Employees will now receive SMS Alerts informing about the deposit of tax deducted at the end of every quarter. The new step is an effort by the Income Tax Department to directly communicate deposit of tax deducted, through SMS alerts to salaried taxpayers, at the end of every quarter. In case of a mismatch, they can contact their deductor (Employer) for necessary correction. Simultaneously, SMS alerts will also be sent to deductors who have either failed to deposit taxes deducted or to e-file their TDS returns by the due date. All taxpayers who wish to receive such SMS alerts are advised to update their mobile numbers in their e-filing account (Income Tax Filing Portal). I hope this post is informative and useful. Do you receive Form-16 every year? Did you face any ‘non-payment of TDS issues’ from the IT dept? How did you respond to such notices? Kindly share your views. Thank you! My Employer has issued as Incentive amount and also paid TDS against it which is clearly reflecting in Form 16 in March 17 but now I have resigned and now employer is saying it was by mistaken calculated and rejected to give my Incentive amount. I have already paid the tax in July. Please suggest how to get that amount..
Has the TDS been reflected in your Form 26AS? In case, they are not giving you that incentive, you may ask them to revise Form 16 and reverse the TDS entry, based on this you may revise/rectify your ITR. Legal Fight?? It depends on your Salary agreement. Suggest you to kindly check with your HR dept and settle this amicably. I am an NRI holding an NRO saving account in a bank in India. Since interest in NRO saving is taxable, my bank deducted 30.9% on my saving interest for FY 2016-17. But the bank did not issue me Form 16A neither they deposited my tax as the same is not reflecting in my 26AS till date. Despite repeated request from bank to even higher authorities of bank, all falling on deaf ears with no response. So I filed my tax return for FY 2016-17 as per my 26AS without including this amount in my TDS. My tax for FY 2016-17 has recently been processed. Now how can I claim my TDS refund? Should I ask bank to refund it because they never deposited it against my name or should I ask Income Tax department to refund my TDS which they never received? To whom should I approach? And where is this TDS gone? You may have to contact your Assessing officer and submit a written complaint on the concerned bank. I worked in a company from 1985 to 1988. Last year I claimed the PF amount. But TDS was deducted on the PF withdrawal. Neither I received TDS certificate nor I can view it in Form 26AS. May I know the procedure to claim the TDS refund. Kindly guide me. Dear SRINIVAS Ji ..If EPF amount is less than Rs 50,000 then TDS is not charged, but it is a taxable income (if pf is withdrawn in less than 5 years). Also, if one submits Form 15g/h, TDS is not deducted by the EPFO. Kindly read : EPF withdrawals & new TDS rules. I was supposed to get around Rs. 1.08 lakhs but i received nearly Rs. 70000. Inspite of submitting PAN Number, the TDS deducted at the rate of 34.6 %. Is there any procedure to claim the refund? or can I submit the form 15G now? Kindly guide me. 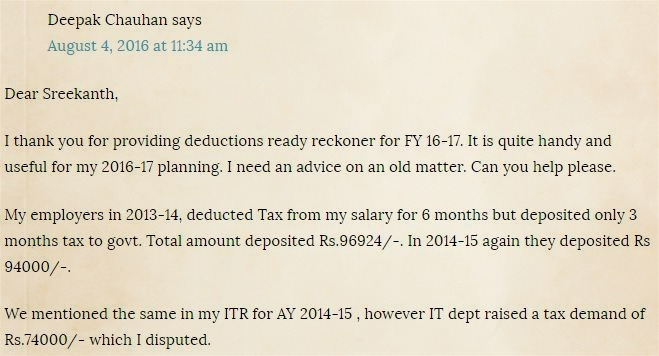 Dear SRINIVAS ..In case, they have deducted higher TDS, you can claim it as REFUND (if any) when filing your income tax return. 75 Thousand in the place of Rs 4.5 Lakhs. The employer hasn’t provided FORM 16 and made corrections even after requests. Can I efile using my payment slips and file for grievance later? Dear sarat ..Your employer has to revise and correct Form 16/TDS entry. If they are not issuing you Form 16 then you may contact your Assessing office and complain about this. Mean while, you can file your ITR based on your payslips etc and then reply to tax notice (if any) to justify your stand, the IT dept may take action against your ex-employer. I received my form 16 for FY 2016-17 from my recent past employer on 11th June. I have some queries regarding the Form 16 listed as below. 1) The two fields “Certificate No” and “Last Updated on” at the beginning of form 16 are blank .Please let me know why it is so.Is certificate no is mandatory for all the form 16? 2) The field named “Employee Reference No.provided by the Employer ( If available)” is also blank on the form 16. I request you please clarify me for this same. 3) In the table I (PART A of Form 16) there is a sub-column named “Receipt numbers of From No.24G” is placed under the column named “Tax Deposited in respect of the deductee (Rs. )” .Please check the position of that sub-column. Because I think it should be under the column “Book Identification Number (BIN)” of table I (in the PART A of Form 16) . 4) According to the Table “II.DETAILS OF TAX DEDUCTED AND DEPOSITED IN THE CENTRAL GOVERNMENT ACCOUNT THROUGH CHALLAN” (in the PART A of Form 16) Total tax deposited in the respect of Employee (Rs.) is 0 (Zero) and the columns under “Challan Identification Number (CIN)” are blank. If your employer has downloaded Form 16 from TRACES (TDS Reconciliation Analysis and Correction Enabling System of the Income tax department) then it should bear a 7 character alphabet unique certificate number. Has any TDS been deducted by your employer (as per the form 16 given to you)?? Thanks for your reply.The PART A of Form 16 has not been downloaded from TRACES Website by My Employer .It is a company generated Form 16 . TDS deduction is showing as “0” (Zero) for all the four quarters by my employer . Though the “Receipt Numbers of Original Statements of TDS ” are available but the columns say “Amount of Tax Paid or Credited”/”Amount of Tax Deducted (Rs. )”/”Amount Deposited remitted (Rs. )” are having Zero value for all the four quarters. If TDS is not applicable, it is not mandatory for an Employer to issue Form 16. So, looks like this is their own template. Should not be of any issue. Suggested reading : What is Form 16? Thanks Sreekanth again for your valuable suggestions. 1) So, do you mean to say if TDS / Total Tax deduction is zero for any employee then it is not mandatory for the employer to download the Part A of Form 16 from TRACES website? Can The Employer Prepare the The Part A of Form 16 manually if Total Tax deduction is Zero? 2) If The Part A of Form 16 is manually prepared by Employer then is it mandatory that this will be bear “Certificate No” and the date for the field named “Last Updated on” at the beginning of the Form 16 Part A? 3) As you know that my Total tax deduction is Zero but the sub-column “Date on which tax deposited (dd/mm/yyyy) ” and “BSR Code of Bank branch” under the column named “Challan Identification Number (CIN)” of Table II in the Part A of Form 16 did not bear a Valid Date/Valid code . Is it mandatory that the sub-column “Date on which tax deposited (dd/mm/yyyy)”must have a valid date or “BSR Code of Bank branch” must have a code even if your tax deduction is Zero? I have a AN FD in a Bank for which they have deducted TDS at 20% and paid but i have a PAN and not submitted it to them ..Is there any chance for getting 10% refund of the money deposited?If yes?HOw can i get it? You can get the Refund of TDS (extra), by filing your income tax return. Hi sreekanth,. Great article above. Wondering if you could answer the below specific issue regarding TDS non compliance by employer. My wife worked with a company for 2 years and the employer has been deducting TDS every month and has issued the pay slips showing the TDS deduction. However the amount never got credited, nor did my wife receive the form 16. She made several communications to the employer but they have kept delaying and not yet filed giving some excuses. We have filed the returns based on pay slips and now the it Dept has sent us tax payment demand notices to pay the tax. Clearly the tax has been deducted by her employer and we don’t want to pay it from our pocket. We allow would like to understand how to proceed. Appreciate if you could be kind enough to guide us on the next steps. Suggest you to contact your Assessing Officer and submit your grievance. Your employer is at fault and they have to bear the penalty. You may also try submitting your query @ eNivaran portal. Do keep all your documents for future reference (payslips, final settlement etc). My Mother a State Govt Employee and her case is the same as mentioned by Mr Nitin. I submitted grievance through eNivaran Portal after receiving an Intimation u/s 143(1). I attached her Form 16 and Bank Statement showing salary after tax deduction for their reference. But she received a rectification order u/s 154. She is contacting her employer frequently regarding the same but there is no proper reply from them. Please guide me in this matter. Dear Pranavi ..May I know if the Tax dept has mentioned any details in the Rectification notice? They haven’t mentioned anything except their tax computation and the amount to be paid as per their calculation and the rectification process. But as per my knowledge, I can proceed for rectification only if the employer deposits the amount and the same reflects in Form 26AS. Does rectification serve the purpose in any other way? In that case, it makes sense to meet AO in person (if possible) and present your case to him/her. You may have to submit copies of all available documents (Form 16s, Salary slips etc). You may complain against the employer too (its surprising that a state Govt is an employer here..). My income is less than taxable limits so i had never filed any returns. I have deposited Rs 57000 cash all in one go, quoting my pan no on pay-in -slip in my savings ac due to demonitisation. Pls let me know will be recieving any notices from tax authorities. Pls let me know if any steps have to be taken as precaution. Dear Abhijit ..Kindly do not worry! The threshold limit for cash deposits is Rs 2.5 Lakh. 1. Altenative investment avenues (short to medium term) to bank FD as far as tax liability is concerned. 2.Better option between dividend and growth (out of debt mutual funds) in terms of low tax burden and safety of capital. 1 – You may consider investing in a MIP fund with growth option for 2 to 5 years for accumulation purposes. 2 – You may consider opting for SWP option in Debt or MIP Funds. Read: Best and top performing Debt funds.